Davis Mechanical Corp is proud to serve the Plymouth community! Referred to as “America’s Hometown,” Plymouth, MA is a U.S. town with great historical significance. Plymouth was the site of a 1620 colony founded by the Pilgrims, who arrived in the U.S. via the Mayflower. Plymouth was the site of several prominent events in history, including the first Thanksgiving. Today about 56,500 people call this community home, and it serves as one of two county seats for Plymouth County, with the second being Brockton. Plymouth is also located about 40 miles south of Boston. There are several notable points of interest located in Plymouth. Plymouth Rock is arguably the city’s most famous attraction, as the rock is said to have been site of disembarkation by the Pilgrims. 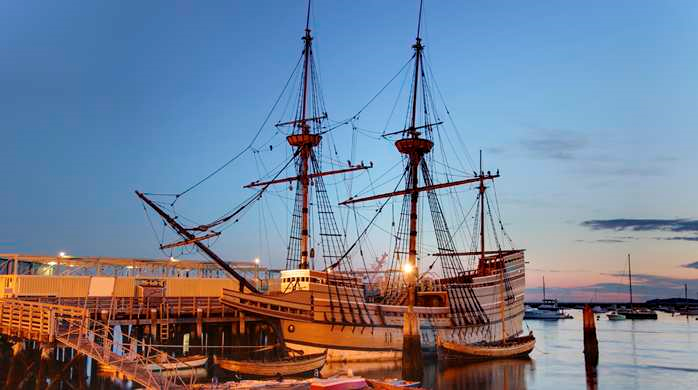 They Mayflower II is also located here, and it is a full-size replica of the Mayflower, which is the ship that brought the Pilgrims to America in 1620. For more modern attractions, there are numerous golf courses located in Plymouth, including Southers Marsh Golf Club, Waverly Oaks Golf Club, and Pinehills Golf Club. Wine enthusiasts might enjoy visiting Plymouth Winery or the Plymouth Bay Winery. The climate of Plymouth is a transitional zone between humid continental and humid subtropical areas, which is typical for much of Massachusetts. Humidity levels are high throughout the year due to the city’s location on the Atlantic Ocean. The warmest month of the year is July when average high temperatures reach the low-80s, and residents will be able to stay comfortable when they have their home central air conditioning units serviced during the cooler spring months. The coldest month in the year is January, at which time average highs only reach the mid-30s. The community is vulnerable to Nor’easter weather systems which can bring significant snowfall during the winter, and to stay safe, a heat pump or home furnace is crucial to keep temperatures comfortable and to prevent pipes and plumbing from freezing.